Apply online on the Advising Office Job Application page. The Student Ambassadors are current business students who assist the college with various recruitment activities throughout the year. They serve as hosts/greeters at recruitment events, serve on student panels, give building tours to visiting families and correspond with recruits through email and postcards. Contact Mark Davis or stop by the Business Advising and Student Engagement office. The College of Business is seeking new members to represent the college as Student Ambassadors. The Ambassadors selected will represent the college during the academic school year. Their term of service will begin during the fall. Student Ambassadors will have the opportunity to interact with current students, prospective students and faculty at various recruitment activities throughout the academic school year. This is a volunteer position. Information Technology Services is seeking a Tier 1 IT Technician who is highly motivated and driven to provide excellence in customer service. Primary responsibilities: Providing technical support to students and faculty/staff by email, phone, support tickets, or in person; including troubleshooting problems with software, operating systems, computer hardware and network connections for faculty, staff and students. Technicians are expected to maintain a broad and continually evolving knowledge of technology, policies, procedures and end user education. $10.15 per hour. Up to 20 hours per week. Academic Year + Summer Hrs Possible. Apply online at Technical Services Application. Provide accurate guidance and assistance in the operation of all hardware, software, media, multimedia, and other equipment and technology supported by ITS, and resolve problems or escalate as necessary. Proactively respond to walk-in and telephone inquiries by providing accurate answers and solutions to common questions and problems, and escalating all other issues as appropriate to help ensure a prompt and positive resolution for the end user. Perform basic maintenance and troubleshooting functions in ITS computer labs and classrooms to ensure clean, productive working environments, and to resolve problems, or escalate as appropriate. Closely follow timelines, checklists, and other reminders to ensure routine tasks are properly and consistently completed. Enforce policies in ITS computer labs and classrooms. Maintain clean working spaces in all ITS computer labs and classrooms, as well as in the User Services and storage areas of the ITS department. Participate in team projects that enhance the quality and efficiency of ITS. Continually build and improve job-related skills and knowledge, especially during on-the-job downtime. Information Technology Services is currently seeking highly motivated, customer oriented projects and infrastructure technicians to provide computer support and deployment of systems for end users. Successful applicants will possess excellent customer service, communication, troubleshooting, multitasking, and technical skills. Responsibilities include maintaining a broad and continually evolving knowledge of technology (computer hardware and software, printers, networks, client management tools), policies, procedure and end user education. Must have maturity, attention to detail and reliability to provide user support accurately and consistently. Join our team and work on exciting and challenging IT projects within a culture based on respect and collaboration. Pay is starting at $10.15/hour for 15-20 hours per week Monday-Friday. Work study desirable. Apply online at Technical Services Application. To be considered you must indicate your available hours for the Fall 2015 semester. For questions, contact Jeff Sherrill at jeff.sherrill@unl.edu or call 402-472-5251. 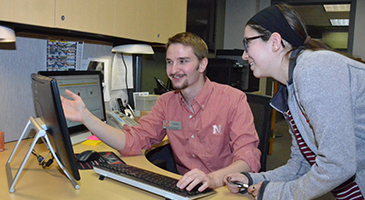 Applicants must be currently enrolled Nebraska students taking at least one credit hour. The College of Business is currently seeking students to work in the New Media Department as a video production assistant immediately. Candidates will work both independently and in a team with the Video Production Coordinator and other members of the ITS Team. Experience with audio/video production (pre-production, recording, and editing) and a basic knowledge of image exposure control is necessary. Functional knowledge of computers/media equipment, including hardware/software troubleshooting is preferable. Familiarity with photography and having a creative eye for digital design is desired. Candidates wo possess good customer service skills and willingness to work with clients are highly desired. 15-20 hours per week Monday-Friday. Work study desirable, but not a requirement. Applicants must be currently enrolled at the University of Nebraska–Lincoln, and must be taking at least one credit hour. Apply online at Technical Services (Video Production Assistant) Application.